HomeBlogUncategorizedPPCWhy is my CTR so damn low? With Google Adwords (or SEO for that matter) when you find a keyword that converts well and that gives you good orders/leads at a great cost per conversion you want more from it. You want to squeeze as much traffic out of it as possible as you know that the more traffic you get the more sales you will get. Unfortunately this can sometimes be tricky – sometimes you can bid up a keyword into position 1 but even once there it’s click through rate (CTR) remains pitiful. You check that you are not abusing your customers in your ad copy and see what some of the other competitors are doing with their ads and you find that (as objectively as possible) that you have strong ad copy. So wassup? Today we are going to look at the process you should go through when you find yourself a bit stumped as to why your click through rate (CTR) is so damn low, and we will of course then give you some pointers on what you can do to improve it. 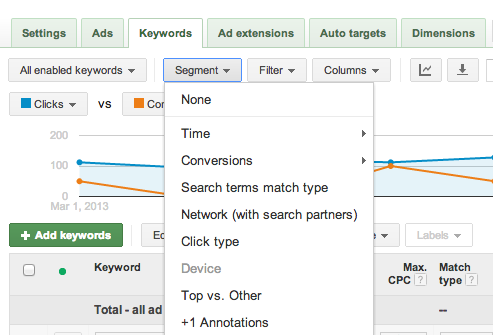 First up – What is a good click through rate for Adwords? This does vary greatly with each keyword, and in fact each auction as there are many influencing factors e.g. a domain that is almost synonymous with a specific product (think Amazon on book related searches), or whether or not there are product listing ads within the results, and if so where they are positioned etc etc. You will probably have an idea of the specific auction peculiarities for your top keywords so can adjust due to this to work out whether your CTR is poor or not. If broad match keyword are we getting irrelevant searches? Do we have a low impression share through day parting and compete aggressively at that time? Are we also running on the search partner network – how does performance vary? What about ad extensions – are we missing any critical ones? Here we refer back to best practices – see this infographic on how to write the best PPC ads. In this case the keyword is exact match so we know that all of the searches are relevant to the ad we have written. We looked through all of the competitor ads and could not see any reason why ours were losing – we had a good clear attention grabbing headline, strong call to action and ads that were focused to the searchers intention with this keyword. Another report that was released in 2012 is the Auction Insights report, this allows you to compare some of your performance indicators directly with specific competitors – at first glance it can be a little confusing but with a little interpretation a fair amount can be learned from this report. 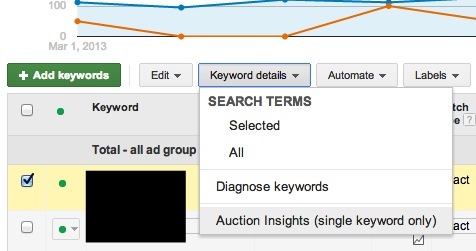 To get the keyword insights you need to select an individual keyword and then click on “keyword details” and then choose the option “Auction insights” as shown in the screenshot below. The first thing to look at here is the “position above rate” as this shows you who is beating you and how much of the time they are beating you. You can see here that 2 of the competitors have a position above rate of 99% so this means that when our ads are shown together they almost always rank above us. If you now look at the impression share column you can see that we had our ads served for 100% of the available impressions for this keyword whereas the 2 competitors that are beating us have a much lower impression share – this could be because they are only running ads at specific times of the day. It could theoretically be because their bid is too low to get all of the available impressions but that does not make sense considering that when they do show they always show above our client. So; in order for us to show above them more of the time we will need to bid up during peak trading hours. The next thing that we looked into is the network that we are running on and it quickly became apparent that our CTR in Google search was very good when our ad was shown in the top positions above the search results; this perhaps accounts for the good quality score of 10/10. However; most of the impressions came from the search partner network when we were in lower positions. Unfortunately it is not possible to split the search partner network targeting into a separate campaign to better understand the performance and also to bid differently so we are forced to just bid appropriately for the two together. another reason why CTR may suffer is if you do not use relevant ad extensions: For example if you are a restaurant and you do not run call extensions to allow mobile users to click to call or if you do not link up your Places extension to show address details then you could lose clicks and sales. In Adwords you can check on the part of your ad or ad extension that was clicked – in the example below you can see the comparison between the headline, the product extension and the ad sitelinks. This data does not mean that site links are bad – they probably help the CTR overall as they allow your ad to take up more space on the page and to say more about your offering but the fact that most people click on the headline is probably more down to the nature of how people are used to using a search engine. It does look like the product extensions help the click through rate as when they are shown we get a better click through rate than on the headline as people are interested in specific products. Looking at this I cannot see any action that needs to be taken. A number of the factors we have looked at here in this post can be found under the “Segment” option on the keywords tab (shown in screenshot below). Play around with the different reports under here to see if and where any data stands out. Considering what we have found through the auction insights data it would be interesting to know the performance of this keyword by time of day; unfortunately the smallest unit of time available under segments is by day. Under the dimensions tab you can get a performance report by hour of the day but this is at ad group and campaign levels only, so you would need to put a keyword in it’s own ad group to work out at what time of day the CTR is suffering. 1) Keeping a close eye on the performance of the search partners vs Google Search. 2) Test a slightly higher bid to try and get more top of page impressions. It’s important to remember that ads can always be improved too and to keep testing.